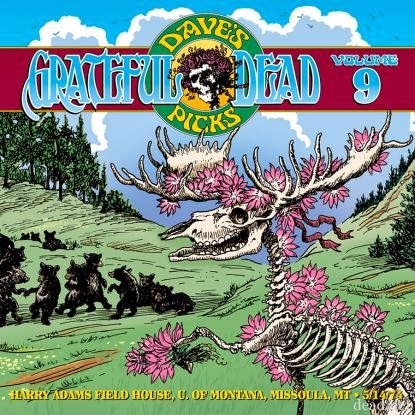 The first selection in this years Dave's Pick's quarterly release series is a another quality soundboard recording from the Grateful Dead vault. Hailing from May of 1974 this performance is from Missoula, Montana and finds the group in full improvisational attack mode. This concert contains deep explorations injected with a mellow space jazz vibe. While possibly not as fiery as shows like 5/19 and 5/21, there is a band mind meld that takes place during the concert's 'big' songs that directs the slowly surging psychedelic mist that descends upon the band from the mountainous landscape. Keith Godchaux and Billy Kreutzman are the heroes of this concert with both band members giving definitive performances. What is also noteworthy is that this the beginning of the 'Wall of Sound' tour, with the band dragging along the monolith sound system which would turn their sonic dreams and creations into tangible reality. The first set opens kinetically with a high speed and emphatically sung 'Bertha', breezy and loose like a screen door swinging unlatched in the breeze. Fan favorite for the time, 'Me and My Uncle' follows next and keeps things escalated with a cooking rendition, punctuated with Lesh detonations. After decompressing versions of both a slow shimmering 'Loser' and a regal 'Black Throated Wind', the first highlight of the concert begins with the rare combo of 'Scarlet Begonias' paired with 'It Must Have Been the Roses'. This early 'Scarlet' stretches out, developing into a vibrant rebounding jam that forsakes the reprise, spacing slightly, then sliping into a floral 'It Must Have Been the Roses'. The usual, that is to say amazing 1974 textbook versions of 'Jack Straw', 'Tennessee Jed', follow next in the set, before climaxing with a cresting 'Big River' that raises the show to the next level. The first 'Playin In the Band' of the tour then closes the extended first set in a mysterious and syrupy fashion. This 'Playin' is a full band performance, with all the players taking moments to initiate changes in the jam. The musical journey percolates kinetically, always threatening to spill over into a frothing mess, but staying just below boiling point, increasing the tension. 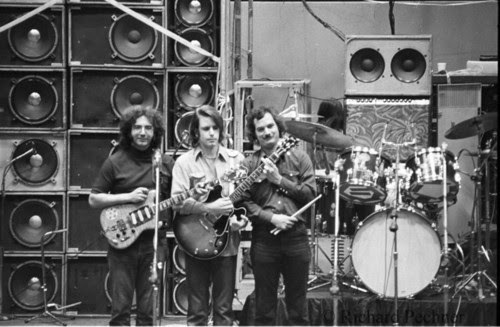 Godchaux and Garcia play with thick effects through the early stages of the jam, but at seven minutes Garcia goes clean and enters into a tumbling accentuated jam that Billy K seems to telepathically connect with. Around nine and a half minutes the entire band jumps into a tree lined ravine, into a tangle of brush and blow down, their form only visible through cutouts in the forest landscape, only then to disappear into a haze of mist. A short space develops where the band regroups momentary, only to reemerge a gurgling and rumbling mess, rising like subterranean earth bubbles, breaking the surface in a blast of heat and organic materials. Playing as one instrument the group escapes the grasp of the ground, Kreutzman swings the band entirely around back into a 'Playin' tinged groove. Around fourteen minutes Lesh grumbles some chunks that swells into another schizophrenic meltdown. Garcia jumps on quotes from the 'Playin' theme that appear briefly and then lose consciousness in waves of sound. Unfortunately this spacey dark jazz excursion is marred by a clumsy return to the reprise-- caused by how far out the band had taken themselves and being unable to navigate the way home safely.The 'Playin In the Band' signals the conclusion of a loose and well played full band display for set one. The second set begins with a summery 1974 'U.S. Blues' that dances on spry feet, well before the time of its permanent placement as an encore. Following solid versions of 'El Paso', and 'Row Jimmy', the big movement of the evening prepares to take place. 'Weather Report Suite', by this point in 1974 had become one of the major vehicles of improvisation for the band. 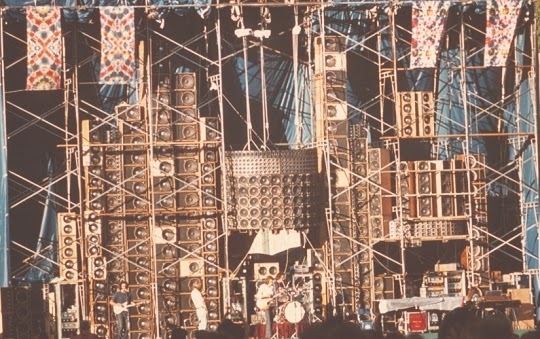 Huge versions of the suite preceded and spawned many mammoth jams at upcoming concerts like 6/18, 6/28 and 7/19/74. This early tour evening is no different with the perfect high speed outro jam of 'Let It Grow' becoming a flourishing array of accelerated and disorienting licks by Garcia and to a lesser extent Weir. Lesh is surprisingly staying close to the edges of the pocket while Kreutzman morphs into a multi-limbed deity. From fourteen minutes on into the suite, things start become atonal as Garcia brings the group level by level gently down to the land of 'Dark Star'. One out of only five versions played in 1974, the band embark on one of the final classic pre-retirement 'Star's' The band cruses through the theme briskly, drifting into a weightless space at four minutes where Kreutzman keeps the band afloat with his exited percussive exploits. The band seems almost on the verge of drifting away into the black expanse of space lazily until Lesh starts to pop and Billy starts to push more aggressively. A darkly psychedelic Garcia stars to prod Lesh into madness, creating a fish eyed jam that swim's briefly before again falling into a empyrean space. Keith is the first to awake and at nine minutes and another full group swell coalesces, similarly to the first set "Playing', every one in the band is pressing the jams directional buttons. At half past ten minutes Lesh groans, the music turns, becoming a celestial tablecloth pulled so quickly that all of the musical glasses still remain stoically on the table. The 'Dark Star' theme forms again, then dissipates amongst a wash of feedback, wah-wah'd piano and Lesh's martian communications. Strangeness prevents the verse from appearing at first, but it finally does, moving slowly through a thick jelly of verse one. As soon as the verse is sung and finished, Garcia employs a waspy distorted tone, contrasting with Weir's warm chording, Garcia then strangles the strained over driven notes, Lesh joins in and maliciously scrapes strings as trippy bird bells shimmy by on small clouds. The music deepens, gradually darker, a back country dusk shading its creation and at eighteen minuites the band reaches the place they have been searching for since the first set 'Playing'. The boiling point has been breached, the band is a slithering organism, shapeless, shifting through various alien musical landscapes. The improvised music pours from the stage, crisp and clear. The rest of the 'Dark Star' is why we love this band. Lesh takes charge with deep strikes, initiating the next series of jams starting at twenty one minutes. The streaky groove moves on brisk bell cymbal hits, becoming something much greater than itself when Godchaux hops on electric piano, leading the band and nudging Garcia up and over a series of hilly melodic licks. 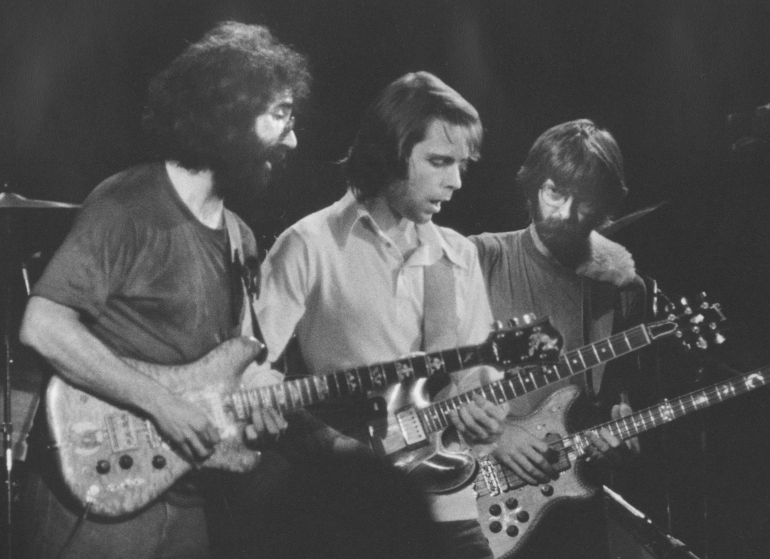 Just short of twenty five minutes a seriously slimy meltdown occurs, Garcia stabs aggressively at the thick air, Lesh slides relentlessly up and down the neck of his bass, a glorious orgasmic sway is reached, swirling, then descending perfectly into 'China Doll'. Appropriate, when takes in the context of the shaded and disturbing jamming that had preceded its appearance. Wow. After the astral traveling that has just occurred, the band decides to now rock the socks off of every one in attendance with a absolute fire breathing display of rabble-rousing rock and roll. First the band blasts through 'Promised Land' shake every one down, then enters one of the finest 'Not Fade Away's' of the era. At four minutes in the jam explodes in a strumming extravaganza, Garcia unfurls through a series of melodic statements created, quoted, some new, some familiar, all amazing. This enters a 'Goin Down the Road Feeling Bad' that goes pedal to the medal for the distance. The band must have thought that they already busted their metaphorical nuts, because they end the concert there, without returning to 'Not Fade Away'. No problem, because there is not much more they could have added to the combo after blazing it to the ground.The band returns for a hot 'Saturday Night' encore, with some additional Weir exclamations for added effect. The crowd is obviously pleased and satisfied. Dave's Picks 9 comes from an era Deadhead's are familiar with, enjoy, and have deeply ingrained favorites from. 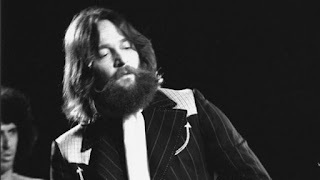 The featured concert from May 14, 1974 is worthy of its official release in may ways. It's different..... this is the main reason I find it to be such an exceptional release. While it can be argued that the 'Playin In the Band' pails to others even in the same month, the analysis of what is contained within this particular performance reveals unique and amazing glimpses available only here. This concert finds the band in a exploratory and pensive mood that not only changes their approach to the music, but finds them listening to one another even more intently than usual. 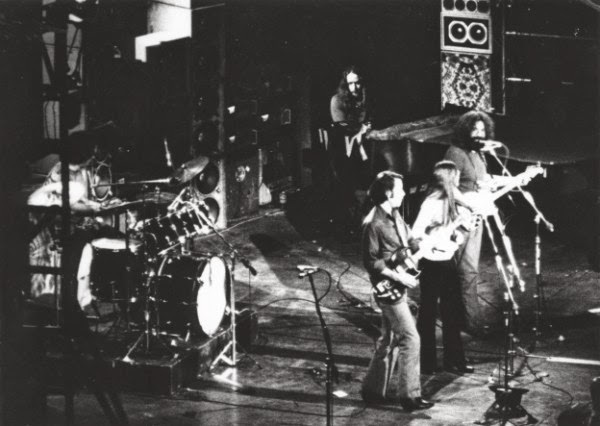 The formless improvisations taking place in the second set stand witness to the deep clairvoyant and even paranormal communications taking place in the Grateful Dead when they were playing there very best.